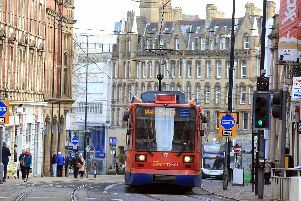 A transport boss has sought to allay concerns over the future of Sheffield’s beloved Supertram – after it was revealed the network could be axed unless the Government stumps up £230 million. South Yorkshire Passenger Transport Executive said the current trams are 'coming to the end of their working life' after more than 20 years’ service but there is not currently any money set aside to replace them. SYPTE is set to apply for £230 million funding from the Department for Transport which would allow the tram system to keep running for another 30 years. But the transport body also warned that if they fail to convince ministers to release funding the tram network could become a thing of the past. The announcement this week has sparked concern among customers, business and political leaders that losing the tram system would be a ‘disaster’ for the city. But Ben Gilligan, director of public transport for SYPTE, sought to reassure concerns and said a team of experts are pulling out all the stops to put forward the “best possible business case” to the Government. Mr Gilligan described the current network as “sound” and the funding they are applying for is to secure the system beyond 2024. SYPTE is looking at three different options as part of their business case:- to replace the trams with more buses, maintain the network as it is or to renew and modernise the system. A public consultation asking for passengers’ thoughts on the plans states that if they are unsuccessful in securing funding the tram network “may have to be closed and decommissioned” – a warning which has caused alarm in some quarters. Mr Gilligan said removing the tram network is a real possibility or it “would not have been included” in the plans. He revealed SYPTE is not currently working on an alternative plan for if the Department for Transport refuses to stump up the £230 million. This is because the team are confident of making a “strong business case” and it would be counter-intuitive to have people working hard on alternatives that may not be needed. Business leaders have expressed concern that securing funding from Government could be tricky after a devolution of powers deal for the region hit problems last year when Doncaster and Barnsley pulled out of the agreement. But Mr Gilligan believes this will not affect their application as it involves ‘different Government departments’. Questions have also been raised about the state of the tram network’s finances as taxpayers are still projected to be paying for the installation of Supertram until 2056 – some 61 years after the network opened after it ran four times over budget. Criticism has also been aimed at transport chiefs over the delivery of the Sheffield Cathedral to Rotherham Parkgate tram-train project, which is nearly three years overdue and £60m over budget. But several different transport bodies are involved in delivering the scheme and Mr Gilligan stressed budget targets from SYPTE have been met. Depending on how the pilot project goes, more tram-trains could be ordered in the future, he added. Despite problems with the delivery of this scheme, there is still an appetite for extending the line. Bosses at the Sheffield City Region earlier this month revealed an ‘aspirational’ transport masterplan for new tram, railway and bus links to meet demand in places including Oughtibridge, Stocksbridge, Chapeltown Parkway, the Northern General Hospital, Batemoor, Waverley and Swallownest. Mr Gilligan said the business case they are working on at present focuses on the current network and if there is “demand for extension” then funding would be sought from “other sources” at a later date. An outline business case will be sent to the Government next year before a more detailed plan with a preferred option is submitted in about 2020 for ministers to make a decision. Mr Gilligan said he is aware there is huge interest in the Supertram and urged the public to take part in the consultation. He said: “We recognise the important role that the tram network plays and we have received over 800 responses to the consultation so far in a matter of days, which shows how passionate people are.